How did Alex Trebek know? How did he know that my first love is technology? Is that why he chose today, Valentine's Day, to be the first in a three-day series of Jeopardy! episodes featuring Watson? For those of you who don't know, Watson is an artificial intelligence program developed by IBM specifically to compete on Jeopardy! 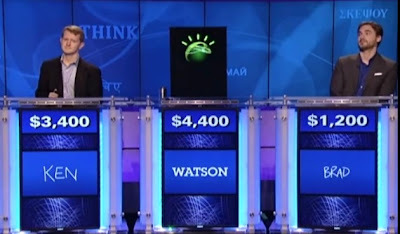 This week, it will take on Brad Rutter and Ken Jennings, the biggest winners in the history of the game show. And, according to the Facebook status updates I've seen today, apparently I'm not the only person who was planning to tune in. Geez, why are my friends all such nerds? What's that? You say I'm a nerd, too? No, let's make this clear: I'm a geek, not a nerd. There is a fine difference between the two, as you can clearly tell from this Venn diagram. OMG, thank you, Sam! 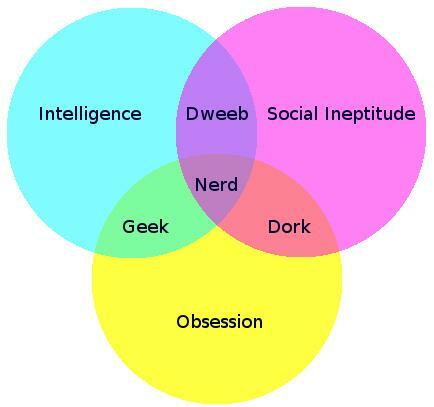 That Venn diagram *finally* makes the meanings of "geek," "nerd," "dweeb," and "dork" clear to me. Where did you find that? !